Normally when I make a card, I search my stash for the perfect stamps, and work from there. I saw this print on pinterest, and really wanted to re-create it. Chalkboard, fantastic quote, and a little out there. I like it all. Not everyone is going to like this card. My hubs gave it a "meh." But I give myself a thumbs up for stepping outside my comfort zone and creating a card using a grand total of 2 stamps. What do you think? Would you boldly put your own handwriting on a card? I'm feeling a little under the weather, and trying to care for two feverish babies - bleh. 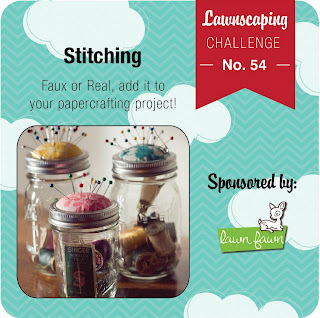 But I did create a fun little tutorial, and it's being featured on the lawn fawn blog today. You can create a folded tag from any of the new lawn fawn dies! For the rest of the how-to pictures, click over to the lawn fawn blog! ps, every time I do my nails, I remember how bad I am at it, hee hee. I backed the focal mat in a brighter pink, and adhered the leaf-stems-only to the base. I love the little pop of color! The sentiment (from so much to say) was embossed onto a banner flag and adhered with a little strip of pink lemonade twine. I've been waiting for a "lull" in my blogging schedule, to be able to share this card with you! We crafted it at the last class I taught, nearly a month ago. I was asked to create a pretty wedding card, and with equal parts softness and bling, I would proudly present this to any newlywed couple. I'm linking this card up to the moxie fab challenge, "emphasize the negative." There's still a few more days to play along! I covered each mini album page with a piece of dewey decimal or pink lemonade paper, and sanded the edges for a seamless look. The bag of mini-marshmallows was folded over the top, covered with a doily, and then I used my crop-a-dile to punch through all of the layers. Some yellow/white twine sealed it all off. For each topper, I created a little tag. I used my favorite easter bunny, plopped him onto a stamped background (using interlocking backdrops). I created the "bunny poop" label via my computer, and once printed, stamped and die-cut it with bannerific. Since I used PTI's limitless layers circle dies, and used some sequins, I'm linking this project up to their March blog hop. Thanks for stopping my way! My Sofia is 7 years old, and tried her hand at mama's favorite technique: masking. She designed her own card, from start to finish, and it's on the Just Me Prints and Paper designs facebook page. If you would like to see it, visit me there and leave her a little comment - I'm sure it would make her day! It's the last day of lawn fawn inspiration week, and today we're showing off a great new background set: sharp backdrops. The arrows went for a safari feel on today's card. I masked and stamped animals and trees from "critters on the savanna" to create a little scene at the bottom of the card. I love how only the lion was given the 3D treatment (If you don't count the lion, this is a 1-layer card!) After they were all colored, I masked the animals and stamped the arrow background to fill the entire card-base. I did not mask the trees or the rock that the zebra is propped up on - that would have just been silly *grin* I actually like the way that the arrows show through the trees - it's a cool effect! My sentiment was stamped out using "riley's abcs" and I love how it's right-justified. It gives the arrow background a place to shine, and is just plain fun, stacked over there on the side. I hope you've enjoyed my inspiration week projects! It's been fun! If you are looking my lawn fawn "home sweet home" post, then click *here* or scroll down. 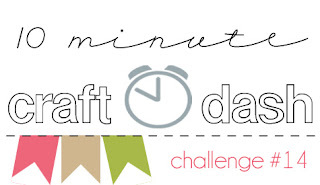 It's time for another 10 minute craft dash! And, with lawn fawn sponsoring, some of the girls got to playin' along. I thought to myself - been there, done that, when the lawn fawn girls were gasping over the short time frame. But you know what? It's still a rush! I kept it pretty simple: a kraft card-base, a banner label that I found in my reject stash (it was already embossed with that waffle pattern), and 2 square die-cuts. I stamped a bunny (from "happy easter") on each, and colored around the bunnies, to bring in the pink and green colors that are required for the challenge. I also did a tiny bit of shading on the bunnies, using a light grey marker. Once I adhered them to the card-base, added a few hearts, stamped my sentiment, and stamped extra bunnies for the whiny child, I had already hit a bit over 9 minutes. I took the last minute to debate whether or not to add some sparkle to the white hearts. Time ran out and I was still paralyzed in indecision. Saved by the ding. I hope you decide to play along! There's a lawn fawn prize up for grabs. After a day break, we're back with more lawn fawn inspiration. "Home sweet home" is just the sweetest set. I created a little framed scene for you, and tried to show it off as best I could. The twig and birdhouse were cut with the oh-so-amazing matching lawn cuts and popped up. I'm still lovin' the fact that I can stamp, color, and then die-cut. And it works perfectly every single time. The rest of the scene was stamped, colored, and then masked so that I could stamp the subtle line image from "interlocking backdrops" in a light brown ink to fill the entire background. I also added a blue 'frame' around my scene: I impressed the card-stock with a woodgrain pattern, and then cut it into 4 strips, fitting the corners together with "mitered" edges. I love my pink-bellied birds, and those coiled flight lines, especially. Be sure to check out the lawn fawn blog for more "home sweet home" inspiration! Hi there! It's group post time over at CSS, and we're featuring fun sets of packaged goodies. I created a trio of packages that all are different, but work together because of a unified color scheme. I'm thinking of keeping these around for my mom's birthday: a little gift card, maybe some cute jewelry, and a few chocolate treats would fit. And really, wouldn't it be more fun to open 3 presents on your birthday than just one? Especially if the packages are all this cute? The gift-card fits into the mini tri fold 1 die, and I stamped it with a pink chevron and gave it a grass-skirt-of-a-sleeve. Ha. I didn't realize it looked so hula until I saw the pictures. Either way, my love for those Martha Stewart scissors is still going strong. A fun paper bow sends the sleeve over the top. The little cube die-cut was stamped with a soon-to-be-revealed stamp set (wait until March 24th!) and I tried to channel my inner Laura Bassen. My double-stamping isn't nearly as perfect (Laura revealed that she often stamps an image twice, for extra concentration of color), but it gave a hazy water-color look to the stripes, which I've decided that I love. Two yarn bows on the top added even more softness to the tiny box. My favorite piece is definitely this one: I used the party favor 3 die to create my bag, and stamped it with a subtle tone-on-tone pattern. My large flower is made from heart dies! I used most of the sizes and a few of each size, to form this large flower. A bit of rolled-up fringe worked well for a flower middle. What do you think of the flower? Do you love it as much as I do? If you do, let me know in the comments, and I will put together a photo-tutorial. Another day of lawn fawn inspiration! Today, we're showcasing the fun papers found in the Daphne's Closet collection. They're full of retro patterns, and with fun paper names like bell bottoms, cute cardigan, and prettiest blouse - how can they not put a smile on your face? I've create a trio of treat boxes for you using the new papers, and had a bit of fun with the new "blissful botanical" dies to create folded name tags. I attached each embossed leaf to a mini-clothespin, and clipped them onto the boxes. If you don't already know how to create a folded tag using any of your lawn fawn dies, I created a step-by-step tutorial, which Kelly Marie will be featuring on the lawn fawn blog before the end of the month. I hope you try it - it's so fun! Imagine, a little hedgehog tag? A mailbox tag? Oh sweetness - a gnomie tag?? The possibilities are endless. Before we bought the girls a bunk-bed, Amar made a headboard for Sofia using some beadboard and crown molding. I have since claimed it for card photos. Not too shabby, for about 15 bucks! I don't always rely on natural light to take my photos. I often have to shoot quickly for a deadline (who's procrastinating? me??) so I do have to shoot in my basement. I'll show you that set-up sometime in the near future, and share the equipment I use to make it happen. I created a sunny background, using blue for the "feel better" sentiment, and made sun rays out of the Belinda's borders line image. I cut a circle into my white focal mat, and then another, smaller circle into a hot pink carstock mat, finally leading to the plaid patterned paper (from the Daphne's closet collection) and that adorable little sun. I love the tiny images included in "so much to say" - they're adorably lawn fawn, in miniature size. The banner shape is from "home sweet home" and the "smile" sentiment is also from "so much to say." When I'm not "staging" my card, I usually just grab a kitchen chair, and bring it close to the patio window (where I get great light in the morning, but not so much in the afternoon - you have to know your lighting!) I used some patterned paper for my card background, and stacked a few cedar planks underneath my card to ground it. I'm too lazy to buy foam core board, or anything else to bounce the light back onto my card: I wrap my kitchen curtain around another chair and that seems to work just fine for me. I hope this card brought a little sunshine to your day. I hope you'll come back to see more lawn fawn over the next few days! I made one for dad the other day. So, it was only fair to make one for mom too, for my first Saturday Creations post of the month with Precious Remembrance. The "mom" banner is a bit of a cheat, too. I stamped the "mom" rectangle, cut 2 fish-tail-banner edges, and just tucked them underneath. The extra "you inspire me" sentiment is from my all-time favorite Precious Remembrance set: Positive Thoughts. I paper-pieced my little family of bears, from Mama Elephant's "nursery deco" set. 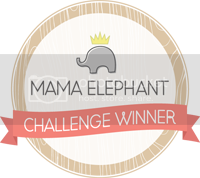 And, speaking of Mama Elephant, *this* card was chosen as one of their challenge winners. I'm thrilled, and so happy that I'll be guest designing for them in the future. Do you remember *this* little gift set I created? 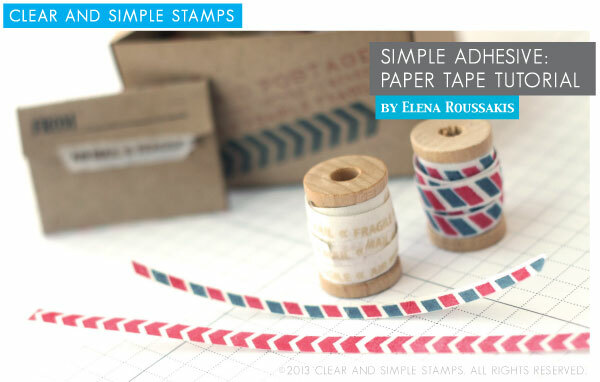 I'm doing a photo tutorial over at the Clear and Simple Stamps blog. Check it out! I stamped the sentiments collage-style, and came up with this. Everything was stamped in black onto a white cardstock base, and then embellished with a newsprint background and a healthy amount of distress inking. I love the glasses image! They were stamped twice so that one layer could be popped up, and given the glassy, glossy accents treatment. Click over to the Precious Remembrance blog to see a reveal of the full set, and what the other designers have created with it!